Efficiency in nature's biomolecular processes, such as photosynthesis, is not wholly explained by conventional theory. The EU-funded PAPETS project explored quantum effects to better understand these processes, recently leading to further insights into the possibilities for quantum computation. Until relatively recently it was thought that the strange behavior of entities reported from quantum physics, was manifested chiefly at the submicroscopic level. However, over the last few years, questions have been asked about the role of quantum behavior in more everyday, macroscopic biological processes. The EU-funded PAPETS project previous work on such biological phenomenon, principally in photosynthesis and olfaction, has fed into these recent findings. Two quantum effects might explain biological processes which have somewhat puzzled researchers, namely: the ability to exist in several locations at the same time (superposition), along with being able to instantaneously disappear, and then reappear in an entirely different place. Researchers drawing on work conducted as part of the PAPETS project, explain in the journal Physical Review Letters how they recently managed to exploit temporality for quantum computation tasks performed on dynamic random networks. In order to test the limitations of quantum computation, the team studied a spatial search algorithm using quantum information, to find a marked node on a random temporal network. The authors point out that it had already been demonstrated that quantum computation would offer a speed advantage in search tasks within networks above a certain threshold of nodal connectivity. However, they also found that below this threshold of connections, the quantum advantage no longer held. In the study the researchers continually randomised the actual arrangement of the network, with the number of connections also changing, while keeping the number of nodes constant. 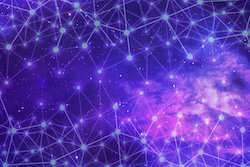 They found that whatever the degree of connectivity, the quantum search algorithm always found, what they refer to as, 'a frequency' for generating new network arrangements, to find the marked node. Interestingly, the team discovered that even when they imposed a bias resulting in a very low connectivity of nodes, with many nodes isolated from the rest of the network, the algorithm created new networks arrangements at a faster rate to compensate. The researchers' results were counter to the expectation that when trying to find a marked node in a network, whether it be social, natural or technological, the quantum search algorithm would struggle with the ever-changing nature of the network (losing and gaining links over time). In fact, they demonstrate that this temporal feature can be used as a control for the computation's performance. While the team anticipate their work will benefit quantum information technologies, for communication and computation, it also contributes to the understanding of biological processes. The PAPETS (Phonon-Assisted Processes for Energy Transfer and Sensing) project is now over. It was set up to explore how electronic and vibrational dynamics, specifically phonon-assisted mechanisms, plays a key role in the structure and function of biomolecular systems. The project examined the role that quantum effects might play in making plant photosynthesis as efficient as it is, by allowing the energy carrying excitons to explore different paths in the leaf simultaneously, finding the most efficient route to the target fuel molecules. The results are contributing to efforts to design better solar cells. Additionally, the study looked at the way that quantum effects might aid the olfactory ability to recognise smells from molecules, through a process known as 'quantum tunneling', which helps a smell molecule unite with a receptor. This understanding holds out the prospect of developing technologies for odour sensing which could, for example, detect hazards in food or water.